Razer has today launched the Razer Phone, a high-end, Android-based smartphone powered by the Qualcomm Snapdragon 835 and sporting a 5.72” display with what Razer calls the mobile equivalent of G-Sync. For those who stay up to date with hardware news, the Razer Phone is unlikely to come as a surprise, and it is in fact a direct result of the firm's acquisition of smartphone specialist Nextbit earlier this year. 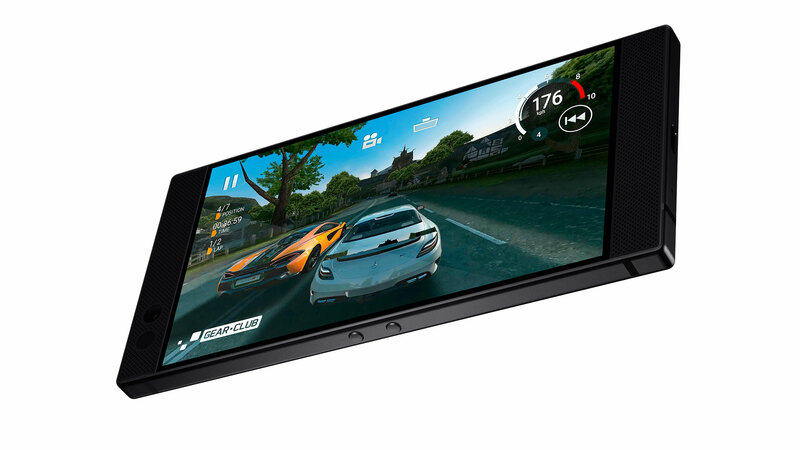 For such a gaming-focussed company, an entry into the smartphone market may seem like an odd move, but the company argues that the Razer Phone is for gamers rather than solely for gaming. After all, gamers are just as likely (if not more so) to have a smartphone as anyone else. And what do gamers want from their smartphones? According to Razer, it's primarily entertainment, and as a result the Razer Phone has been optimised for music, video, and gaming all at once. Physically, the Razer Phone measures 158.5mm tall, 77.7mm wide, and 8mm deep and weighs 197g. The display is a 5.72” IGZO LCD touchscreen with a 1,440 x 2,560 resolution and a Corning Gorilla Glass 3 coating. Large front-facing speakers are positioned above and below it, a design that Razer says is optimised for the landscape orientation most will use when gaming or watching videos without hands getting in the way. Similarly, the power and volume buttons on the edges are centred so that resting fingers in this position have no chance of accidentally hitting them. The material finish of the all-aluminium CNC chassis has been adopted from Razer's laptop range in a bid to make it look and feel like a Razer product. It also helps in this regard that the Razer Phone has the iconic triple-headed snake logo on the back with a chrome finish but available also in green as a special edition - only 1,337 of these will be made. In terms of performance, the powerful Qualcomm Snapdragon 835 Mobile Platform lies at the heart of the Razer Phone, which also features a whopping 8GB of dual-channel LPDDR4 running at 1,600MHz. Razer says it has implemented thermal engineering techniques gleaned from its laptop work to ensure users can play for longer at higher processor speeds without throttling. Battery life from the massive 4,000 mAh lithium-ion battery is said to be 12.5 hours for video watching, 63.5 hours for music, and seven hours for gaming (Hearthstone). With support for Qualcomm QuickCharge 4.0+, it is said to recharge to 85 percent in an hour. A key feature of the phone is the wide colour gamut display. Not only does it go up to 120Hz – a first for smartphones outside of Japan – but it features variable refresh rate technology akin to G-Sync which Razer is calling Ultra Motion, and this is a world first for mobile displays. This is enabled as a result of the Qualcomm hardware, the IGZO display with specific input from Sharp on the drivers, and proprietary work from Razer itself. The result is a screen which can drop to low refresh rates to save power and improve battery life when the display output is static, but jump up to very high ones when motion (like scrolling) is detected to make everything feel smoother. It can also synchronise the refresh rate to the fps of a game or video to make those experiences smoother too. We've had hands-on with the Razer Phone, and it certainly appears to work as you'd expect. Audio has also been a big focus, with the Razer Phone touting dual amplifiers and the stereo speakers sporting Dolby Atmos. For those who prefer to listen with headphones, a 3.5mm jack adaptor is included for the phone's single USB Type-C connection, and the adaptor has a built-in THX-certified 24-bit DAC. The phone does not ship with earphones, but Razer fans will be able to purchase a specially made version of the Razer Hammerhead with a direct USB Type-C connection and the same built-in DAC. The Razer Phone sports 64GB of internal Universal Flash Storage, expandable via the microSD slot. It has onboard 802.11ac Wi-Fi, Bluetooth 4.2, and NFC support. It has dual 12-megapixel (MP) rear cameras – one f1.75 wide-angle and one f2.6 2x zoom – with phase detection autofocus (PDAF) and a dual-tone, dual-LED flash. The front camera is an 8MP f2.0 lens. The phone will come with Android Nougat 7.1.1 installed with a custom Razer version of Nova Launcher Prime licensed and installed by default as well. There will also be a Razer Game Booster app, which can customise performance settings to optimise for power saving or performance for specific games and do other things like disable notifications while in-game. The Razer Theme Store will be available at launch and will offer game-related themes to customise the look of your Razer Phone. Razer is also working closely with various developers to have specific quad HD, 120Hz versions of their games released to boost the experience on a Razer Phone. Trailers for Tekken and Final Fantasy XV were shown at the launch event, as well as one for a new and exclusive survival-shooter called Ultra Hunt developed by Cmune. The Razer Phone is up for reservation now on the Razer Store. Pre-orders can be made from November 3rd for $699 excluding taxes and will ship on November 17th. UK pricing wasn't confirmed at the time of writing, but £699 including VAT seems likely. Three will be the exclusive carrier partner here (and in Ireland, Denmark, and Sweden) and the phone will be available in Three stores around the country from November 17th. For the US and Canada, Microsoft will be the exclusive in-store partner. The limited edition green logo phone will be available in various quantities at the in-store locations only, including the Razer Store in San Francisco.